Latin America is the planet's most urbanized region. In just over a generation - between 1950 and 2010 - the proportion of people living in cities grew from 30% to more than 85%. By 2050, 90% of Latin Americans will live in cities. Today, there are more than 55 cities with a population of one million or more, including some of the largest metropolitan areas on the planet. Depending on how one counts, there are roughly 2,000 cities driving Latin America's economy. 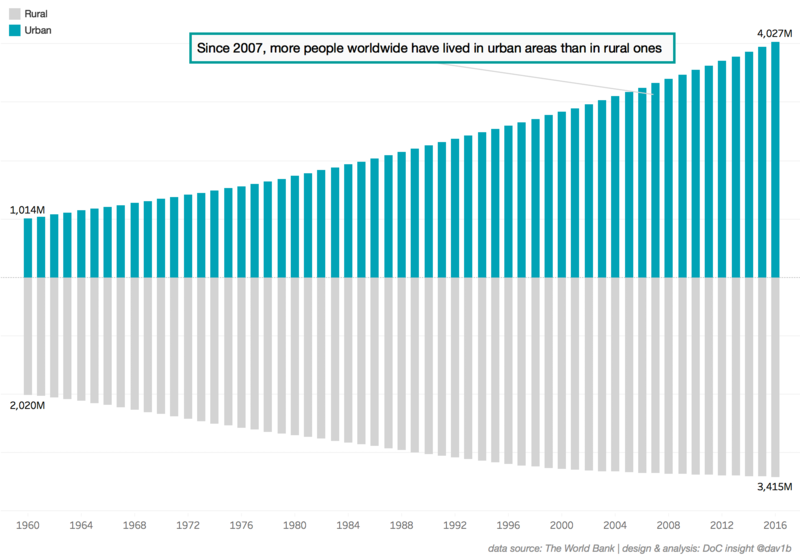 No part of the world has urbanized more rapidly. There’s just one problem: Latin American cities are failing to live up to their promise. One of the principal reasons for this is their massive infrastructure gaps. While urbanization has clearly delivered a host of social and economic benefits, Latin America’s cities have struggled to absorb new arrivals from the countryside. Governments failed to zone appropriately. Rather than fixing the problem, the wealthy elite looked the other way. As a result, poverty rapidly urbanized. Today, roughly 25% of the region’s urban population – more than 160 million people - live in slums. Most urban poor lack formal title and access to basic services. This has exacerbated the disequilibrium of housing supply and demand: three quarters of all new housing is 'informal'. Owing to poor planning and dysfunction in the housing markets, tens of millions of Latin American households live in dire conditions, often at the outskirts of their cities. By and large, they face major gaps when it comes to accessing basic services. More than 77% of Latin Americans lack safe sanitation and only 28% of the region’s wastewater collected from sewers is treated. Not surprisingly, poorer city residents frequently turn to informal providers, including mafia and militia groups, to meet their daily needs. The side effects of the region’s hyper-urbanization affect every layer of society. Sprawling Latin American cities often suffer from low physical, social and digital connectivity, and high fragmentation. Cities across the region are often dispersed and unequal. Due to inadequate public transport solutions and an over-reliance on cars, the region’s cities are among the most congested on the planet. Too often, city elites paper over these challenges. Confronted with accumulated problems, including epidemic levels of crime, these infrastructure deficiencies are becoming harder to ignore. Despite making major strides in reducing poverty over the past decades, Latin American countries and cities are struggling to meet the most basic infrastructure challenges. This is due in part to sluggish growth over the past few years, which has slowed investment across the housing, water treatment, public transport, (renewable) energy and telecommunications sectors. Massive corruption scandals, including cascading Lavo Jato investigations in Brazil, have had a chilling effect, reaching at least 15 Latin American countries. Consequently, there are major funding gaps when it comes to infrastructure spending. The region will need to increase overall spending from 3% to 5% of GDP - about $180 billion a year – to bridge the gap, according to studies. Latin American countries currently spend a smaller share of GDP on infrastructure than any other region, with the exception of sub-Saharan Africa. More than 70% of their expenditure on infrastructure come from public sources, with just 20% from the private sector. In order to attract private financing, every layer of government will need to set out a vision and plan for their cities. A clear strategy, with goals, targets and indicators, sets the tone for public and private investment. Municipal authorities will also need to develop a predictable pipeline of projects spanning public transportation, housing, energy, water, waste and the digital economy. Likewise, cities will need to standardize procedures for investment, including reducing administrative red tape where possible. None of these priorities are new, but that does not make them any less important. The investments that Latin American cities make will need to be sustainable and pro-poor, and they must harness the potential of new technologies. This means designing in strategies that privilege social impact from the start. It also means supporting local authorities to build densely and reduce vertical sprawl; developing schemes to attract and retain talented residents; and building cities that accommodate an ageing population. Ultimately, the most successful cities will be those that work with a wide range of partners to plan for the future. Some Latin American governments have taken steps to promote pro-poor urban infrastructure, especially in relation to housing. Take the case of public housing schemes such as Minha Casa Minha Vida (in Brazil), Queiro a mi Barrio (in Chile) and the Programa de Mejoramineto de Barrios (Argentina), along with similar programs in Chile, Peru and Uruguay. While these interventions were intended to reduce the affordable housing gap, in some cases projects were confined to the periphery of cities and not integrated with wider urban public transport and service delivery. As a result, they have sometimes unintentionally reinforced exclusion and segmentation. In the meantime, Latin American public authorities have generated some impressive advances when it comes to integrated public transport. The most widely acclaimed examples are the Bus Rapid Transit (BRT) schemes, such as that established in Curitiba (Brazil) and the TransMilenio in Bogota (Colombia), as well as the integrated transportation schemes in Medellin (Colombia), the Transantiago in Santiago (Chile) and Metrobus in Mexico city. Today, more than 42 major Latin American cities have mass transit systems and another 327 have bike lanes. While all of these initiatives were driven by forward-looking leaders, based on long-term plans, and involved strategic partnerships, they each encountered financing challenges. Cumbersome procedures and red tape routinely slow down project approval and implementation to a crawl. Just as importantly, despite low interest rates in Latin America, municipal governments struggle to borrow. According to the Economist, non-financial public sector debt has risen from around 30.6% of GDP in 2007 to more than 40% today (and as high as 74% in Brazil). A 2018 survey of industry experts by the GRI Club listed political, administrative and regulatory challenges together with interest rates, currency risks and macroeconomic volatility as the chief constraint to investment. Latin American cities are struggling to attract financing for city development, but this is not due to shortages of money in the global system. Indeed, there is considerable international capital available - at least $7.4 trillion is held by sovereign wealth funds alone. But investors, whether wealth and pension funds or otherwise, are seeking stability and scalability. They are looking for Latin American cities with the right conditions in place: a clear long-term plan for urban growth, capable leadership spanning multiple terms, stable regulatory environments, competent (and depoliticized) public agencies, reasonable credit worthiness, and low levels of corruption. Assuming most of the above-mentioned conditions are met, there are ample opportunities to finance urban infrastructure development in Latin America. For example, cities regularly enter into public-private partnerships to raise international capital. Cities also work with third party institutions such as the International Finance Corporation (IFC) to de-risk investments. Major new sources of capital - not least unprecedented inflows from China - are also jump-starting urban development. And cities themselves are also exploring more opportunities to access local financing, from bonds to pooled financing mechanisms. If Latin America’s cities are truly going to thrive, they need to be future-oriented. Policies that support income growth and redistribution are urgently required. Addressing affordability constraints for the most vulnerable is critical. This will mean experimenting with land titling, occupancy rights, non-transferable short-term leases, community land trusts, and protections against eviction. Governments will need to become more proactive at acquiring land, developing smarter zoning rules and entering into joint ventures to jump-start brownfield and greenfield development. Past mistakes should be avoided: public housing and services will need to be built closer to the centre of city business districts. In some cases, local governments will also need to encourage rental housing (including with preferential taxes, subsidies and housing allowances) and increase the purchasing power of poorer residents. Latin American cities have a real opportunity to take off in the 21st century. Courageous leadership, intelligent decision-making, smart planning and careful investment in modern infrastructure is critical. Take electricity, for example. If cities rely on today’s technology, South America’s electricity infrastructure will cost $23-24 billion every year. If renewable energy and other conservation strategies are introduced, the recurrent costs drop to $8-9 billion, according to a recent World Bank study. The region’s cities have enormous untapped potential. They urgently require the agility to set it free.